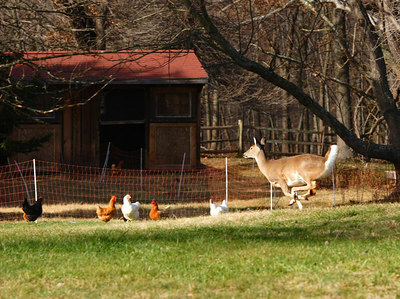 The Barneys – or at least Barney (with the black beak) and his three friends – came to the sanctuary after spending most of their life on the farm of a man who loved them very much. But when he died, his kids wanted to sell the place, and wanted the geese gone. 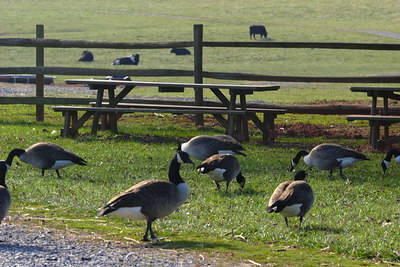 Luckily a kind-hearted person found the sanctuary, so that these geese would have a safe and happy place to live. Only one of them came with a name – Barney. He’s the only one who is easily distinguished from his friends, with his black beak. They’re pretty friendly and curious about people. They’re clearly used to people-as-treat-dispensers, but mostly they just go off and do their own thing, always the four of them together. I’ve been taking “meta” pictures lately, purely for my own amusement. Jonathan is fun and interesting to volunteer with – not only does he know a lot about animals, he thinks a lot about animals, and in ways that are often a bit different than the rest of us. It’s the scientist in him, gathering information and impressions, and doing mini tests on hypothesis percolating in his brain. He’s fascinated by things that I tend to take for granted. 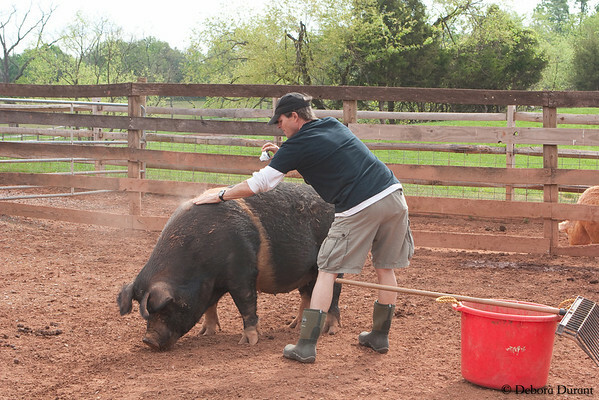 Last week one of the things that caught his attention was the dust rising from Charlene’s back as he patted her. He was trying to get a picture of it. I’m not sure if he succeeded, but I got a picture of him taking a picture! The cows were all hanging around, so I gave Mini Moo a chin scratch. He loves to have his chin scratched! I was thinking to myself that it was too bad that it was impossible to get a picture while scratching his chin, but just a few minutes later Amy gave him a chin scratch, and I took advantage of the opportunity to take a few pictures. I love this because it is so clear how much Mini Moo is enjoying himself. I posted it on Facebook, and (as expected) there was at least one comment about how their cat does the same thing. Taking pleasure in life is not limited to humans. Anyone who has ever lived with an animal will be thinking “duh”, but oddly enough the scientific community is only recently coming around to agreeing that this is a valid viewpoint. Luckily there are scientists like Jonathan Balcombe, who pursue that line of study despite the scientific community’s disdain for the topic. Hopefully things have progressed by now. From the outside, at least, it seems to have. If you haven’t read any of Jonathan’s books, and are interested in the topic, definitely check them out. If you like pictures (and since you are “reading” this blog, you probably do), you’ll want to pick up a copy of Exultant Ark: A Pictorial Tour of Animal Pleasure, which actually has a lot of great words in it, not just pictures. I need to go back and read the book; I am guilty of focusing on the pictures and skipping over most of the words. Tomorrow (Saturday 4/28) is the 2nd annual Baltimore Veg Fest. I’ll be tabling there for Poplar Spring from 1-3. Two other people – volunteers who became employees – will be covering from 11-1. Sunday (4/29) is a benefit day at Great Sage, benefitting Poplar Spring. My favorite vegan restaurant in the area! Poplar Spring Animal Sanctuary leaves “Farmed” out of their title because they are a wildlife sanctuary in addition to a farmed animal sanctuary. They’ve taken in orphaned baby squirrels, wild birds (geese, ducks, and a mute swan) who can’t fly and thus are permanent residents. Of course there are many wild birds who can fly who come and go, and some who come and seem to figure there is no reason to go. After we were done with our chores today, we sat at the picnic tables in the chilly drizzle, ate some snacks and chatted. 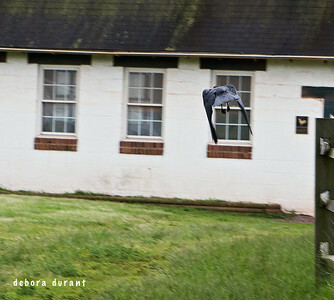 He was at one of the barns and saw an eagle (there is an eagle nest on the sanctuary land) swoop through. Terry and Dave always pay attention to this, because the sanctuary residents need protection from the eagles and other predators, as best as can be managed. The eagle was swooping through the area near the pond, and did a u-turn. Dave was too far away to be able to help, but he realized that the eagle was going for one of the geese who can’t fly. The goose was waddling as quick as she could to the pond, where they are safe, but there’s no way she would have been able to reach it in time. And out of nowhere came a very angry crow, who landed on the eagle and started pecking his back while they were in flight. The eagle flew off, the goose was saved by the crow. The crow was protecting a nearby nest, and couldn’t have known whether the eagle was going for the nest or the goose, of course. Or maybe he did know. How can we tell? The story gives me shivers. I know that the eagle has to kill to survive, but these injured birds who find sanctuary at Poplar Spring, well, it is somehow more tragic to think of them being targeted. And I know, logically, that they are exactly the ones who would be targeted “in the wild” – the weak and injured and infirm are the ones who don’t survive, for many reasons. They are lucky to have the sanctuary, lucky that they made it to the sanctuary. They all have different stories. Some of them came from within a few miles of the sanctuary and were rescued from the Park Service (who wanted to euthanize them), some of them came from as far away as New Jersey. 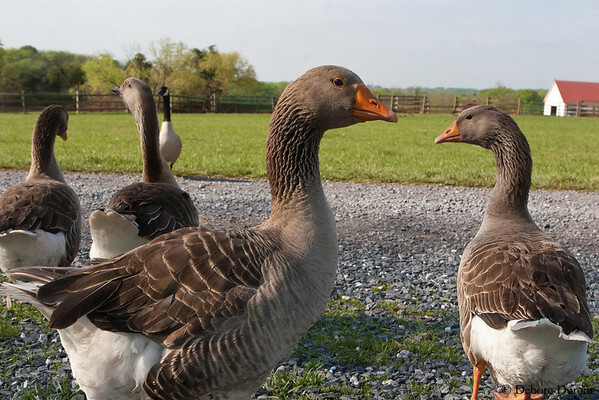 The geese who can’t fly tend to stick together and have formed very distinct friendships, though none of them arrived at the sanctuary together. And so Peaches the goose survived that day, thanks to the Crow. We fed the Crow bagels and cookies and watched him fly away with as much as he could carry. Dave watched him bury one bagel piece under a divot of grass. Maybe his crow babies will stick around the sanctuary and be unofficial guardians of the geese as well. One of the sessions I went to at AR07 was “Relating to Urban Wildlife (dealing with rodents, feral cats, deer, squirrels, other wildlife)” with Share Bond, Peter Muller, and Kath Rogers speaking. I went to this one because it seemed such a practical topic, which I figured I’d be able to put into immediate use with feral cats or whatever other wildlife issues might crop up in my area. Kath Rogers, of Animal Protection and Rescue League, spoke first with a story about squirrels in San Diego who were being poisoned. When their group first got involved in this issue, they didn’t know much about wildlife issues. They quickly learned that part of the reason the squirrels had become a “problem” was that they were being fed by park visitors. This naturally increased the squirrel population well beyond what the natural resources of the park would have limited them to, and the squirrels then became a “nuisance”. They worked with the public, the media, and were persistent, and in the end the poisoning was stopped, and in its place was a campaign to educate the public, including numerous signs in the park asking people to not feed the squirrels. They have used these same basic tactics (Public, Media, and Persistence) in a variety of campaigns, including using polling to show that, for example, the majority of the people do not want the seals at Childrens Beach Park killed, and want a ban on foie gras. Whether or not people agree with their overall stance (a focus on legislative reform to eliminate cruelty; they do also advocate veganism), I think that there are several things that can be learned from their experience, not the least of which we are doing no one any favors, least of all the animals, when we feed the wildlife. What’s really going on is often the obvious to us, but is not welcome news to the people who feel that the wildlife is a nuisance. For example, with geese, what’s really going on would be something like “geese can fly!” It is obvious, and it is obvious why shooting out a geese population wouldn’t work to “deal with” a nuisance geese problem. Since they can fly, if you remove one population, the next group to fly over will see the same bounty of food that the first group saw, and settle in s well. A bit more tact than the blunt obvious would be needed in approaching the town boards and mayors with this ground breaking information. The funny thing is that I grew in the migration path for Canadian geese. My dad would get annoyed every year, as they landed on our lawn and would spend a week or so eating the grass, and then depositing the result of digesting that grass. “Don’t feed the geese!” he would yell at us. 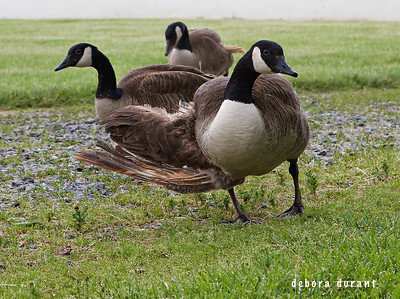 It was obvious to my dad, who never cared two figs for animals, that the “nuisance” geese would leave soon enough, and the less we fed them, the less mess they’d make. Lethal control doesn’t work for deer because their reproductive cycles are influenced by the amount of food they have available. This can be controlled either by overall availability of food, or the size of the population, which influences the competition for the total resources. In other words, if you kill deer, using the excuse of overpopulation, you create what is known as “compensatory rebound” in the deer population and generally end up with more deer than you started with. Similarly, if you feed the local deer population, you’ll enable a growth in deer population that exceeds what the habitat would naturally support. This has a couple main consequences: the deer become dependent on the food you provide, and you will possibly help create what others will see as a “nuisance” population, leading to calls for lethal control. The point to keep in mind is that while our motivation for protecting populations from exploitation and lethal control is our belief in the rights of those animals to live their own lives, it will require more practical arguments to convince the town boards and mayors and maybe even animal control that lethal control should not be used. The truth is that lethal control simply doesn’t work. We need to understand that, and understand why, in order to best protect the wildlife in these cases. We can certainly discuss animal rights as part of the reason to not use lethal control, but the practical arguments for why lethal control doesn’t work shouldn’t be neglected. Sometimes we inadvertently create problems when we are trying to do good. Share Bond, of Protect R Wildlife and SKUNKS, discussed this as related to feral cat TNR programs. She agreed with Peter and Kath that the source of “nuisance” populations is always people leaving food. This can be from bird feeders, where populations of birds that would not normally coexist are brought together in tight quarters, transmitting diseases more easily, and making themselves vulnerable to cat populations which will move in, drawn by the abundance of birds. This could very well be part of the reason bird enthusiasts feel that feral cat populations are such a danger to birds, not realizing that they are making the birds vulnerable by the feeders they provide to help sustain those same birds. The feral cat feeding stations can cause a similar problem, in attracting possums and raccoons. Share thus advocates what she calls TNR+, which is essentially a TNR program where you leave no food unattended. This is more imporant than it might seem at first – if the possum and skunk population feed from the feral cat food, their populations will grow, and they’ll be seen more and more in daylight hours, which tends to freak out the humans using the same spaces. This can result in the feral cat feeding stations being banned as well as lethal control used on the “nuisance” populations, which will likely result in the deaths of some of the feral cats that were meant to be taken care of. Share did a six day study for a large feral cat project to record the impact on the wildlife, and the results seem solid. She also includes a diagram for a simple feeding platform. I haven’t done any direct work with feral cats at this point, so I can’t claim to be speaking from personal experience, but based on what Share explained, combined with what Peter and Kath talked about, my overall feeling is that we should not feed the wildlife. Not feeding the wildlife and educating people are two of the best ways we can protect these wildlife populations. For feral cat colonies, this means following Share’s advice in not leaving any food unattended. For wildlife in general, take pictures, but keep your breadcrumbs to yourself.